Did you know that Memorial Day was first established as “Decoration Day” by the Grand Army of the Republic (G.A.R.) in May of 1868? Just three years after the Civil War, with so many soldiers lost, it was a way to pay tribute to those killed during America’s bloodiest war. To honor their loved ones on this day, many men and women visited their graves and adorned them with flowers to ensure their contributions would never be forgotten. 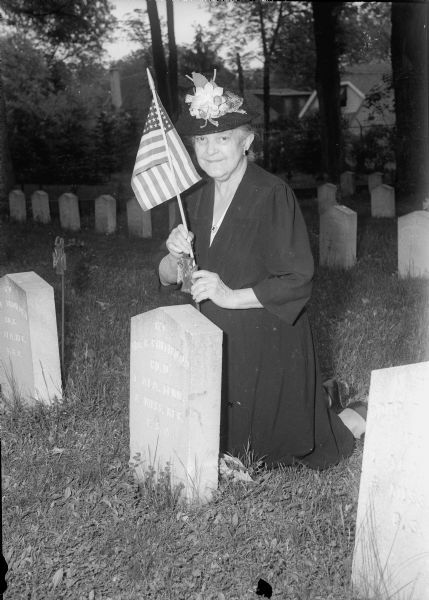 One particular Madisonian, Mrs. Ella Bennett Bresee, the daughter of one of Madison’s oldest families carried on this tradition until the day of her death in 1945. When she was just a child, her father and mother would take her to Forest Hill Cemetery on Madison’s west side to decorate the graves of the Union veterans who were killed during the Civil War. James Bennett was discharged on April 5, 1863, due to wounds he received on an expedition up the Arkansas River. After witnessing so much suffering and death, James wanted to pay tribute to his fellow veterans, so he became an active member of the veterans’ community and a charter member of the C.C. Washburn G.A.R. Post (later known as the Lucius Fairchild Post in Madison). He assisted in decorating Union soldiers graves at Forest Hill Cemetery as part of his post duties. After his death, his daughter Ella carried on this family tradition. Due to her father’s teachings, Ella took a keen interest in patriotic work. During World War I, she volunteered for the Red Cross and started the first canteen service. During World War II, she was responsible for starting the first service center in Madison, which later became the United Service Organization (USO). This ‘Grand Old Lady of Memorial Day’ helps remind us of the true meaning of today; remembering those who gave the ultimate sacrifice. While you enjoy the holiday, take a moment today to remember these veterans and their sacrifices. After all, their sacrifices ensure your freedoms. To learn more about Ella and other prominent Madisonians, join us for this year’s Talking Spirits Cemetery Tour!